Walking the streets of Rome, riding the metro and the buses brings me in contact with large numbers of ordinary Roman women, professionals, vendors, tour guides, sales girls, waitresses, bar tenders, construction workers, soldiers, mothers, grandmothers, daughters etc. My general impression has been of women comfortable in their sexuality, educated, confident and assertive, women who will certainly leave written and other more graphic, more tangible accounts of their lives. was knownto be the power behind her husband's rule. 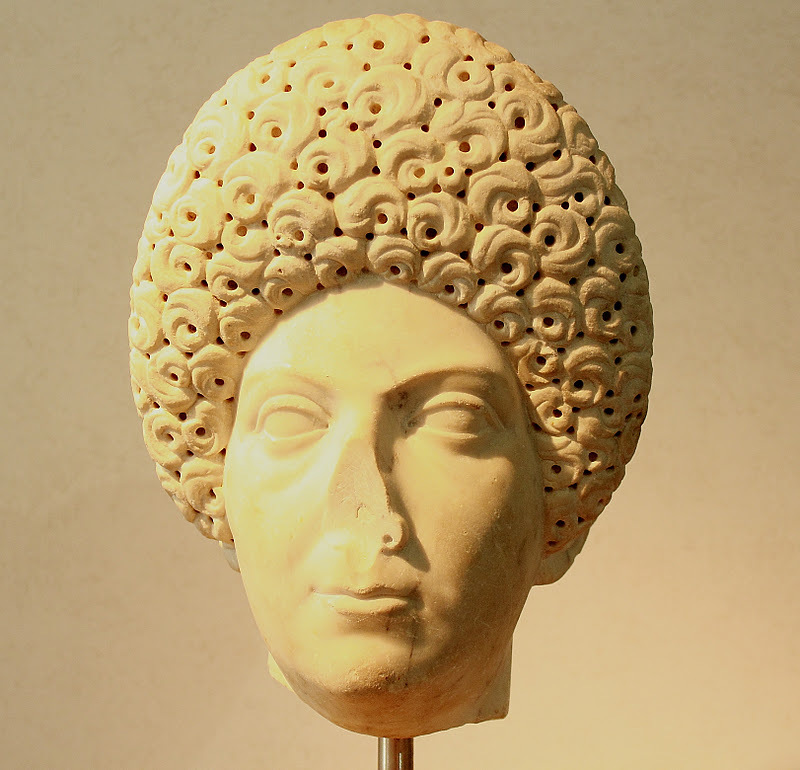 ﻿ Unfortunately, for us, ancient Roman women left hardly a trace of what their lives were like. Accounts of women’s daily life, and in some rare instances a particular woman’s contribution to society, are limited to written accounts authored by men and mostly about the women of the upper or elite class. So it is within this context that we see what life was like for the women of ancient Rome. I have been taking pictures of pictures of these Roman women, and it is intriguing and fascinating to see how much one can deduce (or imagine) from these. ﻿﻿﻿Ancient Rome was a patriarchal society and as such, its women were defined by the men in their lives and primarily valued as wives and mothers. ﻿﻿﻿﻿ From the moment of birth, girls were subject to the rule of their fathers, the pater familias. A symbolic but highly significant ceremony emphasizing this absolute control was carried out at the moment of birth where the infant was placed at it’s father’s foot and left entirely to his discretion, he could accept the child as his by picking it up, or reject it by leaving it where it was. In the latter case, the infant was left at the side of the Tiber or left to starve to death. Accounts of these types of exposures put the majority of infants exposed as being female or very sickly male infants. Another proof of this absolute control fathers had over their daughters lay in their names. Daughters did not really have their own names; they were given a feminized version of their father’s surname. So Mark Anthony’s daughter was called Antonia, Julius Caesar’s daughter was called Julia (she became the wife of Pompey). ﻿ A daughter of Marcus Agrippa was called Agrippina, (the younger, the mother of Nero). If he had more than one daughter the elder daughter would be called the elder, the next daughter would be called the younger, the third daughter would be the third etc. Girls went to public primary school and were educated with or in the same manner as the boys. Children of the elite learned Greek and Latin and many women were well educated and some highly so. However, when they came of age, because women did not take part in public life, formal education ceased and they were passed over to their mother’s care who taught them the skills needed to become good mothers and also how to run a household efficiently. It was the duty of the pater familias to find a husband for his daughters. First marriages were usually arranged but the couple needed to be old enough to consent to the marriage. The age of consent for boys was 14 and 12 for women. It was the practice to choose an older man for one’s daughter and most women would move into their husband’s home. During the early Republic, once the daughter married, control over her was passed from her father to her husband but by the time of the Empire, the father’s control of his daughter remained unchanged even when she moved into her husband’s home. This gave the woman some autonomy in that control of her assets, in the form of her dowry, reverted to her upon her father’s death (in the absence of a male sibling). The primary duty of women was to bear children, being infertile was grounds for divorce. However, they were also expected to be the first teachers of their children. The responsibility of imparting Roman culture and preparing their children for citizenship was theirs. They did participate in politics but only in the influence they could exert on their husbands. There was however in 195 BC, the first recorded protest by women, where the women of Rome came together to support the repeal of the Oppian Law (prohibiting women from buying jewelry, passed during the wars against Hannibal with the support of the women at the time). They gathered en mass in the Forum when the repeal was being debated and were able to have the law abolished. ﻿ A Roman matron's day started with a trip to the public baths. Yes they were allowed to use the public baths. Some of them had separate areas for men and women, while others had women using the baths in the morning, while the afternoon was reserved for the men. There were of course private baths as well. Roman women also took great pains with their appearance, putting on a foundation (which contained high levels of lead), lining their eyebrows with kohl and using eyeshadow made from safron among other things. They also took a lot of time having their hair done, with the empress and other prominent women setting the trend. Roman women's basic item of clothing was the tunic, similar to those worn by men but were fuller and longer. There were two types of tunic, the chiton, which was two pieces of cloth sewed together, leaving holes for the arms and then belted on the waist or under the breasts. The stola on the other hand was fastened at the shoulders leaving a sleeveless tunic. Married women would wear this on top of another tunic, to emphasize their respectability. They also donned the palla, a kind of cloak which could be pulled up to cover the head, when leaving their homes. Roman women had some freedom. They could leave their houses, go to the market, visit with friends and other similar pursuits. They were also allowed to attend the games in the colloseum and attended banquets with their husband. 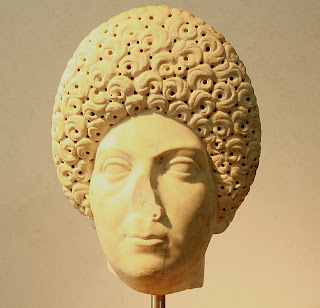 If little is known about Roman women's lives even less is known about the elderly women in ancient Roman society. Historical sources have put women's life expectancy (in ancient Rome) at birth at 20 to 30 years. If they lived to the age of 15, this went up to about 40 to 50 years. As I went around taking pictures, I came across these busts of two elderly women. I would put their ages at around 50 or so, but I could be wrong. This two look decidedly grumpy, I wonder why?